How Long Can Credit Card Rates Stay Stable in the Face of Rising Inflation? The U.S. bank prime rate did not change during the second half of July, remaining at 3.25 percent. There are some powerful economic forces swirling around these days, but one would never know it to look at credit card rates. All of the credit card offers tracked by this survey have been steady as a rock lately, with no changes since early May. Credit card customers should view this stability as a positive. Unstable rate environments make it difficult to make meaningful comparisons between credit card companies, while a stable environment lends itself to rational decisions that can have some lasting value. How long will this stability last? Perhaps the biggest threat to interest rate stability these days is inflation. Low inflation in recent years has been a major factor in facilitating generally low and stable interest rates. For example, the Consumer Price Index (CPI) rose by just 2.1 percent over the past 12 months. However, the warning sign is that in the second quarter of 2014, the CPI increased at an annual rate of well over 3 percent. A rising inflation rate would put pressure on credit card companies to raise their rates to protect their profit margins. Employment growth and the ongoing transition in Federal Reserve policy are also economic factors that could have a significant influence on credit card rates. However, in terms of what could drive rates higher in the near future, the most likely suspect seems to be inflation. With credit card rates generally remaining unchanged these days, the best way for a consumer to get a better deal is to shop around. Be advised though, that not only is there a wide range of different rates among the various credit cards on the market, but there is generally a wide range of possible rates available on any given credit card. The actual rate a customer gets depends on how credit card companies assess that customer's creditworthiness. So, advertised credit card rates should be just a starting point when comparing credit card offers, because they are not specific to the consumer's particular credit situation. When comparing rate offers, it does help to know if one's credit status is likely to land one at the higher or lower end of the range. In the end though, a consumer should not make a final decision about a card before seeing a specific rate quote in response to an application. 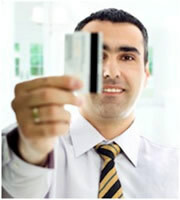 Interest rates on student credit cards are generally higher than those on consumer or business cards. This is because the typical student has built up little if any credit history, so credit card issuers consider them to be a higher risk. Students can view this as both a challenge and an opportunity, because by handling their credit cards responsibly, they can build the kind of history that will earn them lower rates. The spread in rates between rewards and non-rewards business credit cards is relatively small, which is fortunate because non-rewards business credit cards are becoming increasingly scarce. Even so, companies using rewards credit cards should figure out how to administer those programs efficiently, so that the resource of rewards does not get wasted. The average difference between credit card rates for customers with excellent credit and for those with average credit remains at 4.01 percent. 0 Responses to "Credit card rates unmoved by economic whirlwinds"